Here are two recipes for making your own pumpkin puree - now it's easier than ever to eat pumpkin, a vegetable that is surprisingly full of health benefits. If you're like me and tend to only bake with pumpkin in the autumn months, when this bright orange squash is in season, then there is no excuse for not using fresh pumpkin in your recipes. There's no doubt that fresh tastes better and is healthier, but you also never know what additives go into tinned food to extend its shelf-life, so I prefer to stay away from it, if possible. The best thing about making your own pumpkin puree is that one large squash will yield more than you'll need for one batch of baking, therefore you can freeze the extra for future use. That way, you'll have pumpkin puree on hand that doesn't come from a tin! The two recipes below are equally easy to make, so it's really up to personal preference which one you use. I probably slightly prefer the roasted method, only because I hate throwing out the cooking water for boiled vegetables, as much of the nutrition gets thrown out with it. 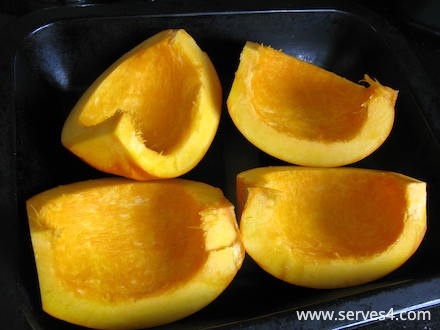 Also, I find it impossible to peel a raw pumpkin, and the roasting method doesn't require you to do this! 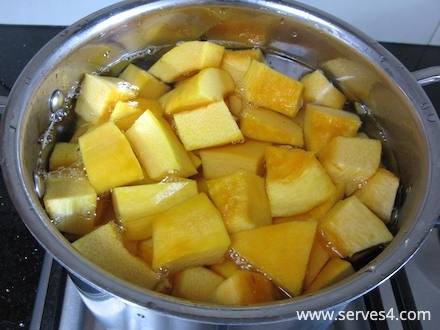 :) I've also noticed that the pumpkin in the boiled method retains slightly more water, so you may need to adjust the liquid content of your recipe, depending on which method you use to make your puree. Wash the pumpkin thoroughly under cold running water. 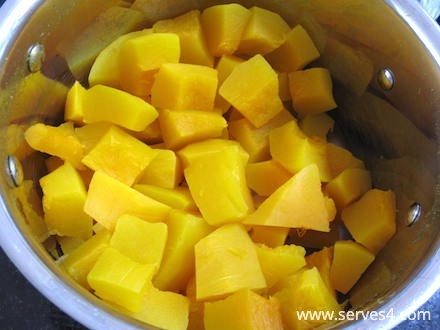 Scoop out the seeds, peel and cut into chunks, placing them into a large saucepan with lid. Add enough filtered water to just cover the pumpkin chunks. Bring the water to the boil on high heat, then turn it down and simmer covered for about 20 minutes. Drain and return the pumpkin to the pan. 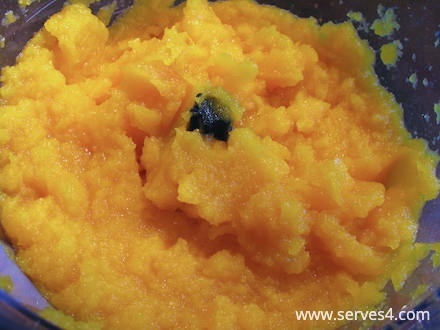 Use a potato masher to blend into a nice puree, or you could place the pumpkin into a food processor and blend it. 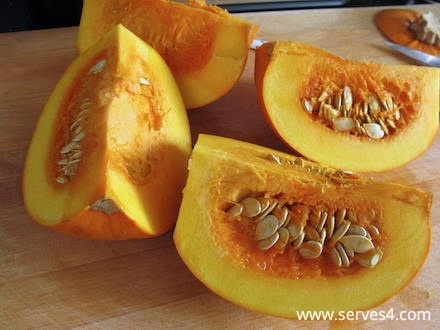 After washing and cutting the pumpkin into quarters, scoop out the seeds, and place each quarter skin-side down in a roasting pan or oven-proof dish. Cover the pumpkin with aluminium foil, and bake in the preheated oven for about 50-60 minutes, or until the flesh is soft. 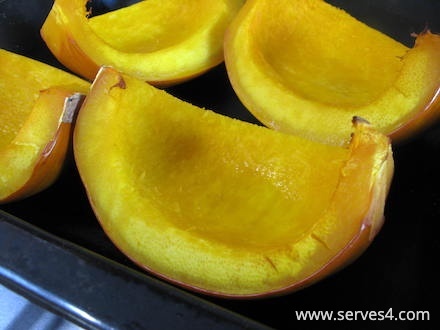 Allow the pumpkin to cool, then scoop the flesh away from the skin with a spoon. 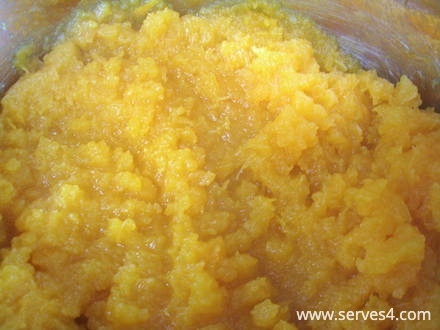 Blend it in a food processor until you have a nicely uniform puree. 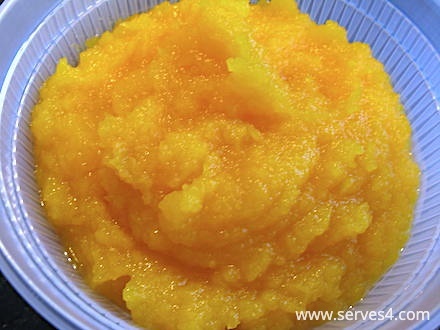 For both methods, once you have made the puree, measure out the quantity you need for your recipe, and freeze the remainder in single-use portions for future use. Happy autumn baking!